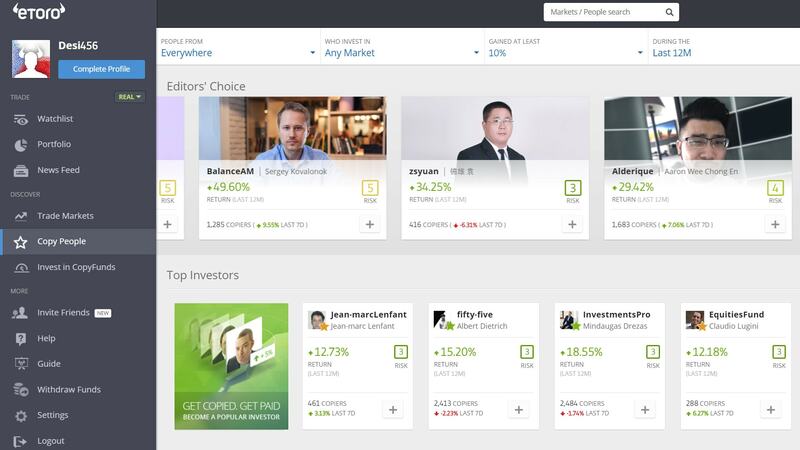 This time, we are reviewing the eToro company and its social trading platform. Let’s have a look at how it works, what it offers and what the fees are. 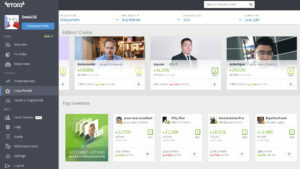 eToro is an innovative and modern CFD provider that ranks among the top social trading networks. The company, founded back in 2007, offers trading solutions for both experienced and inexperienced traders who can benefit from its tight spreads, a free demo account, and an all-inclusive trading platform. Each client can trade on his own or take advantage of the company’s CopyTrader™ technology that is trusted and used by more than 7 million users from over 140 countries. As far as the regulation of the company is concerned, eToro adheres to the strict guidelines of the tier one regulator, the FCA, and of CySEC and ASIC. General Risk Warning: 76% of retail investor accounts lose money when trading CFDs with this provider. You should consider whether you understand how CFDs work and whether you can afford to take the high risk of losing your money. 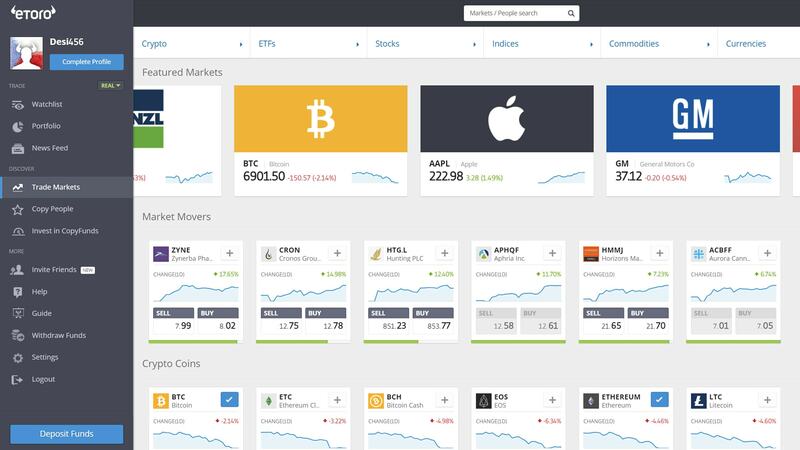 The eToro trading platform is suitable for day traders as well as for long-term investors. Clients lacking experience or time can use the eToro social trading network to follow and copy the moves of the top performing traders on the platform by using the CopyTrader ™ system. This technology replicates all trading activity of a chosen account. You can select the trader you want to copy based on their past performance, risk score, portfolio diversity and much more. Experienced traders who decide to lead other investors can, apart from their earnings, also receive an additional 2% profit reward of their Assets Under Management (AUM). The more successful they are, the higher their position in the ladder board is and the more people copy their trades. The eToro trading platform is very intuitive and you can give it a shot using a free demo account credited with $100,000 virtual money. As a regulated company, the eToro platform is committed to full transparency, which means there are no hidden fees or commissions to watch for. 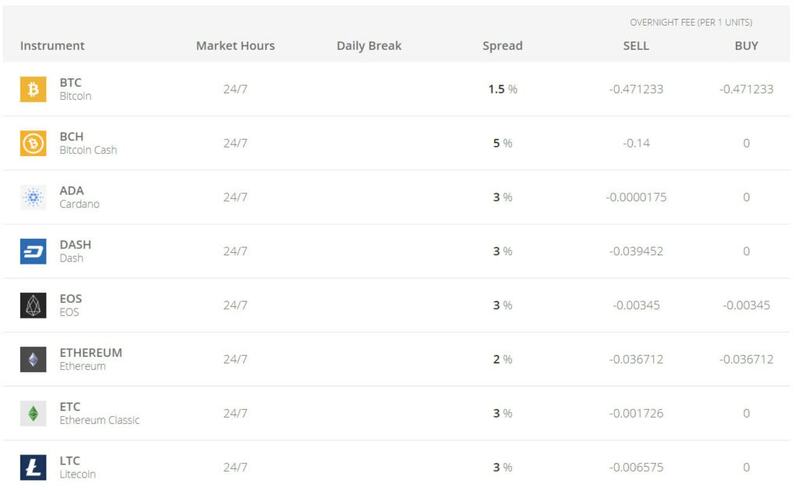 To make all the fees information easily accessible, eToro created an individual Market Hours & Fees page featuring its rates. The following fees apply to cryptocurrencies, the most popular asset category on the eToro platform. As eToro points out, the fees are subject to change and it is advised to check the Market Hours & Fees page regularly to stay updated about the current fees. Update to 06.10.2018 – Spreads for cryptocurrencies were changed, for BTC the spread is now 0,75%. Spreads on other cryptocurrencies were also significantly lowered. eToro features the following 14 cryptocurrencies: Bitcoin, Bitcoin Cash, Ethereum, Ethereum Classic, Ripple, Dash, Litecoin, Cardano, IOTA, Stellar, EOS, NEO, ZCASH, Binance Coin. Traders can trade these popular cryptocurrencies not only against the dollar but also against other fiat currencies (BTC/EUR, BTC/GBP, ETH/EUR, ETH/GBP, EOS/GBP, EOS/JPY, XRP/GBP, XRP/JPY) or digital coins (ETH/BTC, ETH/EOS, ETH/XLM, BTC/EOS, BTC/XLM, EOS/XLM). # eToro is the first ever company to pay for a Premier League partnership in bitcoin. It is now a partner of 6 prestigious English football clubs – Tottenham Hotspur, Brighton & Hove Albion F.C., Cardiff City F.C., Crystal Palace F.C., Leicester City F.C., Newcastle United F.C. and Southampton F.C. # Since the launch of copy trading in 2010, around 78% of all copied trades were closed in profit (data was taken in August 2017). # Unlike almost any CFD provider we know, eToro does not charge an overnight fee on BUY positions on cryptocurrencies (if you do not use leverage). Conclusion – Is eToro a good and safe option? 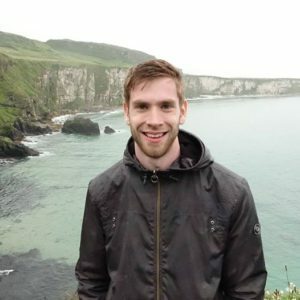 eToro offers a unique trading platform suitable for both experienced and inexperienced traders who can benefit from using the world’s leading social network. The platform is fairly easy to use and I did not experience any freezing or other problems when trading myself without using the copy system. eToro is a credible company subjected to regulatory oversight of the Cyprus Securities Exchange Commission (CySEC, license number 109/10), The Financial Conduct Authority (FCA, license no. 583263. ), and the Australian Securities and Investments Commission (ASIC, ABN 66 612 791 803). I recommend testing eToro and its social trading network using a free demo account that can be set up in no time. Do you trade Ethland (LEND) ? No, I don’t trade this coin. Currently, I focus rather on large and mid-cap cryptocurrencies.